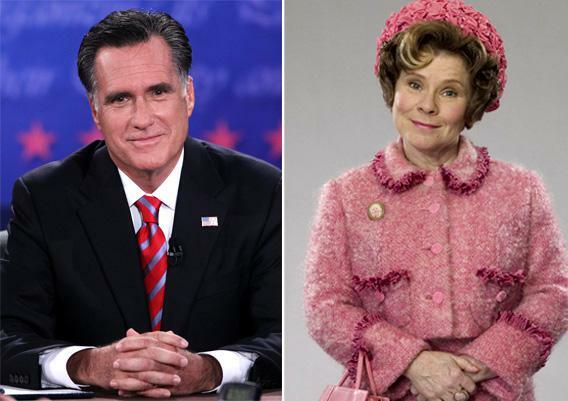 Harry Potter Presidential Campaign: Romney is Umbridge. Obama is Dumbledore. My Harry Potter-obsessed 9-year-old watches the presidential campaign. Photographs by Marc Serota/Getty Images; Warner Bros. Entertainment. Sometimes one gets a little tired of the echo-chamber of election anxiety, the fretful watching of the debates, the scrolling through tweets and Facebook postings to see what everyone else is thinking watching the debates, the brilliant little analyses by friends, the bits of cleverness, the instant polls. So it was sort of relaxing and informative to watch the foreign policy debate with my 9-year-old Violet, who is at that phase of life when she views the world entirely through the lens of Harry Potter. It started in the last debate when she said of Mitt Romney, after hearing him talk for a few minutes: “He’s Umbridge!” And of course I saw exactly what she meant, the brittle, lacquered, self-satisfied smile of the ambitious Dark Arts professor and passionate ministry bureaucrat, Dolores Umbridge. The saccharine, almost-girlish chuckle. The proclamations she issues at Hogwarts, the self-important talk about “the ministry this” and “the ministry that.” The classes doomed to read out loud instead of learning the spells they desperately need. The moment where she makes Harry write lines into his own skin with a pen that draws real blood, all the while smiling that fake and brittle smile. Then of course there is her interest in Muggle Registration, and protecting “pureblood” wizards from the dilution and compromise of human blood. Of last night’s moderator, the sweet-seeming and dignified Bob Schieffer, she said, “Professor Slughorn,” which I thought was a little unfair. Schieffer seemed so civilized, so mannerly, so decent. Professor Slughorn is all those things, but also a little pompous, a little networky, a little hail-fellow-well-met. I did see how Schieffer was a bit bemused, like Slughorn, as if the modern world had taken a few confusing and unfortunate turns. And his attempts to control the debate, to keep the two candidates on the ostensible topic of foreign policy, were reminiscent of Slughorn’s efforts to keep the future Voldemort’s explorations into dark magic totally theoretical. There were other Harry Potter characters lingering in the margins of the debate: Michelle Obama was Hermione Granger: smart, serious, studied. George Stephanopoulos in post-debate wrap up was Severus Snape: slippery, ambiguous, morose. Christiane Amanpour was Madame Maxime. * Diane Sawyer was Nymphadora Tonks, a Metamorphmagus, who can do anything she wants with her face. But what does all of this tell us about the election? Dumbledore dies, of course, in the fight against the Dark Lord. Umbridge fails miserably in her bid for power. Victories are limited in Harry Potter, circumscribed by bloodshed, compromised by exhaustion and loss; ideals are tainted, complicated, twisted, and battered into something else. In Harry Potter, you don’t entirely win when you win. Corrections, Oct. 24, 2012: The piece originally misspelled the first names of Ann Romney and Christiane Amanpour, and the last name of George Stephanopoulos.